Vinnie Chieco, a freelance copywriter, had been offered a new assignment. He was working with a client who had a reputation for superior results–and this client was about to reveal a new product to the market that would create an impact of massive proportion. Chieco was tasked with giving it a name. When he was sent a prototype, it didn’t resemble anything on the market; it was like something from a sci-fi movie. Naming such a radical device would surely be difficult. He needed to communicate both simplicity and revolutionary technology in a single thought. The smooth edges, seemingly button-less device reminded Chieco of a famous line from the movie 2001: A Space Odyssey where the character Dr. Dave Bowman says, “Open the pod bay door, HAL!” In the film, HAL is the computer that could control the ship. The “pod,” in the movie is a spacecraft used for extravehicular activity. Somehow, the word “pod” resonated with Chieco. It seemed to be a perfect fit for Apple’s out-of-this-world travel into the future of music. The release of the iPod has famously revolutionized the music business, and that was exactly what Apple CEO Steve Jobs and the iPod team set out to do; they are an ideal example of a team with a big dream. But it’s interesting to note that their dream wasn’t entirely original, which in some ways made it even more ambitious. MP3 players had already been on the market from other manufacturers. But Apple dreamed of making a player that would be transformative, that would be world class. Let’s not get confused at the difference between a goal and a dream. A goal is something measurable, trackable, and is built on analytics. Goals have realistic timelines, are measured by weighing the data, the risks, and the current assets. They are essential to success, but they follow dreams. A dream is bigger–it has no boundaries, rules, or past history. It’s focused on transforming business as we know it, and approaching from a direction never pursued–or at least never attained. In dreams, we seek the outstanding change–not just within the products we create but in the results those products inspire. For Apple, the dream was to change and dominate the music industry. And the product (in this case, the iPod) enabled that dream to become a reality–shaking the world with results. It wasn’t just the contours of the device. It wasn’t just the technology. It wasn’t the simplicity of buttons. Apple’s dream was so vast that it changed how music was heard, sold, purchased, and consumed. The iPod launched the platform of iTunes. And with such a massive public and music industry shift, the PC world shifted to accommodate as well. This was a dream that defined world-class results. Obviously, the iPod team succeeded. On January 27, 2010, just nine years after its launch, Apple announced that the 250 millionth iPod had been sold–making it the fastest- selling music player in history. Consider this: The initiative was launched in 1997, on the heels of a year in which Apple lost $816 million. That alone leads to an interesting question for all of us: would your organization, on the heels of its worst year ever, take their best people and put them on a team to design a product so far outside your current business model? Oh, and there’s more. Apple at the time didn’t have a pipeline of new talent to back up these stars. The company’s creative reputation was waning, as were profits, so industry insiders hardly considered working for Apple a desirable career move. Next there were equipment challenges. Apple wanted to offer consumers ten hours of continuous play before needing to recharge the device, but a spinning hard drive–the 1.8-inch hard-disk drive where the music is stored and was the iPod’s key technology–requires a lot of battery power, and on top of that it was new in the MP3 space. From an engineering standpoint alone the iPod was a huge dream. Those who signed on to the team were not in the least bit naïve. Jon Rubinstein, who was chosen to lead the iPod charge, had a long history in the computer industry–both in hardware and software. Tony Fadell had started a company called Fuse in the 1990s. One of the devices his company had considered was a small hard-disk-based music player. His company failed, but Fadell still believed the opportunity existed to create something with impact in the MP3 world. Michael Dhuey was an electrical and computer engineer, recognized as the co-inventor (with Brian Berkeley) of the Macintosh II computer in 1987. And then there was Jonathon Ive, the design guru who had been creating all of Apple’s outrageous appeal. The iPod team is exemplary of all of the traits of breakthrough teams that we’ve discussed; the skills of each personally competent team member fit together perfectly. They were all steeped with experience. It was technical savvy meeting creative brilliance. It was a combination of past successes meets past failures. It was a group of men who recognized their individual strengths, but had also gained a thorough understanding that they could not achieve the dream unless they realized the strengths of one another. Dhuey worked closely with Fadell on the hardware development–particularly focusing on the battery. They needed to create something small enough to fit into the tiny casing, but powerful enough to maintain a charge that would oversatisfy users. 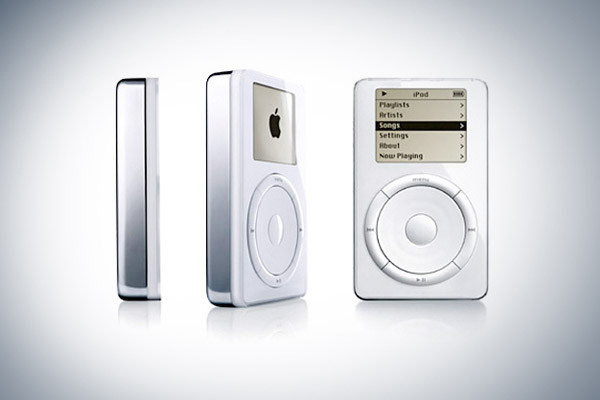 Ive, who had been a design driving force at Apple since 1997, was to offer his brilliance to the sleek iPod look and feel, which made such a profound impression that when the device was launched, it instantaneously became an icon of breakthrough product design. While the process of their breakthrough is interesting, the key point here is that these men weren’t afraid to dream–in fact, they were driven and haunted by their vision. Together they changed the way music is delivered; and they did it with the full intention of wowing–otherwise they may have wound up trapped in the world of the marginal, just like their MP3 predecessors. 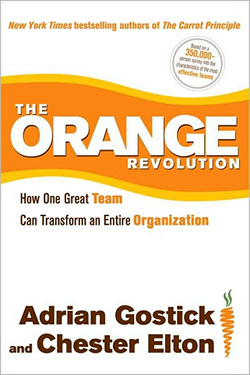 Excerpted from The Orange Revolution: How One Great Team Can Transform an Entire Organization by Adrian Gostick and Chester Elton. Copyright © 2010 by Adrian Gostick and Chester Elton. Excerpted with permission by Free Press, a Division of Simon & Schuster, Inc.